The Black Widow series is Q.E.P. 's premier blade for very fast, chip-and wobble-free cutting of porcelain, marble, granite and ceramic tile. 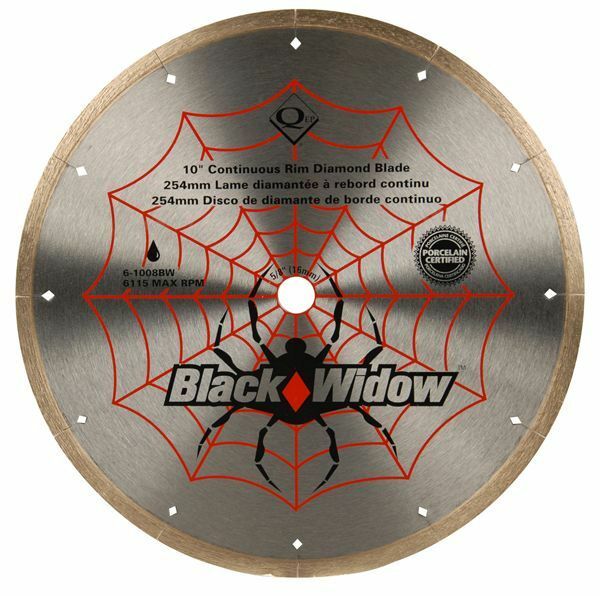 Premium-grade, thin-rim diamond blade for fast wet cutting of porcelain, ceramic, granite and marble tile. Unique diamond shaped laser cutouts prevent blade wobble and keeps blade cooler for a longer life. 7mm rim height for a longer life and for increased cutting contact with the blade. Ideal for high speed cutting of hard masonry tile. Arbor Size: 5/8" - 20mm - 7/8"